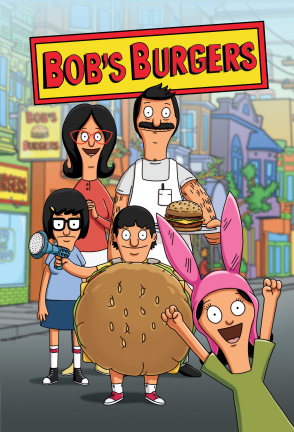 BOB'S BURGERS: The Belchers (L-R) -- eldest daughter Tina, mom Linda, son Gene, dad Bob and youngest daughter Louise -- get ready for the grand re-re-re-opening of their family restaurant in the &quot;Human Flesh&quot; series premiere episode of BOB'S BURGERS airing Sunday, Jan. 9 (8:30-9:00 PM ET/PT) on FOX. BOB'S BURGERS &#x2122; and &#xa9; 2010 TTCFFC ALL RIGHTS RESERVED. This page was last edited on 31 August 2012, at 23:15.